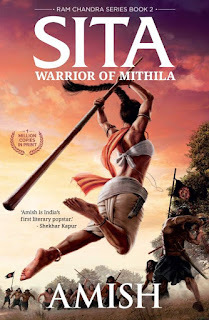 Amish Tripathi, author of "The Shiva Trilogy", the fastest-selling series in the history of Indian publishing industry has come out with second book of Ram Chandra series named "Sita: Warrior of Mithila". The first book Scion of Ishvaku was a blockbuster in which author described Sree Ramachandra different from popular traditional belief and knowledge. The new book with a new look of Lady Sitha was released on May 29, 2017. A teaser video has been released prior to that. It depends on Sita, the magnificent Indian queen viewed as an incarnation of Lakshmi. The story starts with King Janak of Mithila kingdom finding a little girl child in a field, who was guarded by a vulture from a pack of wolves. Ruler Janak embraces her yet he had not pondered that this vagrant young child will be the one required for the of India from the evil goals of King Raavan. Story builds up through Sita's adolescence and tutelage, her marriage with Ram Chandra, and her fourteen year exile, joined by her better half Ram and his sibling Lakshman. Story portrays Sits as mentally strong women who have the ability to stand up and face challenges. The Author of the book, Amish Tripathi revealed the name of this most waited book on his facebook page. It is the 2nd book in the Ram Chandra series which narrates Sita's story. The book portrayed Sita as a warrior and a strong woman but is not written in her perspective. The books gives a message of promoting gender equality in the society. book, Sita: Warrior of Mithila. Although the epic Valmiki's Ramayana portrayed Sita as a devoted wife, in this book author has made Sita's character more powerful , independent , more feminine and strong enough to tackle any challenges. A trailer video of Lady Sita, the fearless warrior was created for the promotion of the book. The video was unveiled by Amish Tripathi along with Bollywood's most popular actress Alia Bhatt.